Ah, the holidays. A most wonderful time of year filled with visions of sugar plums and awakening perhaps to a white Christmas morning (well, maybe not so much in Austin). 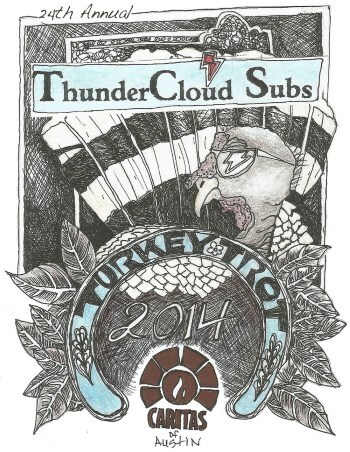 Now in its 24th year, the ThunderCloud Subs Turkey Trot is considered an Austin Thanksgiving tradition. Nearly 20,000 participants from 48 states came out to participate in 2013, making it the largest 5-mile run in Texas. Don&apos;t be surprised if you see a turkey or pilgrim on course - costumes are encouraged! In the serious spirit of holiday giving, ThunderCloud donates one hundred percent of event proceeds to Caritas of Austin, a local organization dedicated to helping the homeless and working poor. One of Austin&apos;s favorite holiday celebrations, the Trail of Lights features 1.25 miles of lighted tunnels and displays in the heart of Zilker Park. The aptly named Ill Walk, Yule Run two mile evening event this year starts at the historic Zilker Tree and ends within the Trail of Lights. All speeds are welcome, but don&apos;t forget to slow down and take in the lights! 2014 marks the Trail&apos;s 50th Anniversary. It may (or may not) be cold outside in Austin baby but this unique, family-friendly run/walk is guaranteed to have you jingling to the finish line - literally. Each participant receives his or her own set of bells, creating a signature holiday sound heard throughout the event. The excitement kicks off at the Domain, a perfect venue for holiday gift getting after the run (and for a much-deserved little something for yourself). Be sure to tell the kids to bring their wish list rumor has it Santa is coming to town for a visit on course. Check out the Austin Duathletes&apos; annual Red Dress Run, also known as the Twelve Bars of Christmas pub run. This event is a local must each December - fantastic for people-watching alone. Prizes awarded for the best-dressed male and female (and yes, guys, you get to wear a dress). Proceeds benefit the Ronald McDonald House of Austin. Event Poster by Turkey Trot Poster Contest Winner Terri Caldwell Bennett.